Drunk Butterfly explores the varied subtleties of acoustic swing in an increasingly eclectic post bop age. With a collective resume that includes work with Anthony Braxton, Burton Greene, Gunter Hampel, and John Tchicai, saxophonist Mark Whitecage, bassist Adam Lane and drummer Lou Grassi bring a resonant historical awareness to this session. With knowing restraint, Whitecage, Lane, and Grassi invest these pieces with a sober sense of maturity, without ever sacrificing the exploratory zeal that defines the finest free jazz. Less a traditional saxophone trio recording than a summit meeting of three stellar improvisers, this date features the musicians on equal footing, as writer, soloist, and accompanist. Each member contributes a handful of pieces, with each tune distinctive in its own right yet thematically adherent to the set's overall post bop aesthetic. Open-ended in approach, the trio pays close attention to harmonic and rhythmic signposts throughout these melodic selections, maintaining a semblance of structure in even the most chaotic passages. Focusing on alto sax and doubling occasionally on clarinet, Whitecage holds forth with a robust tone and facile linear phrasing, as he unfurls pungent cadences that curl into poignant Ornettish declarations. Lane, the youngest member of the trio and principle composer, demonstrates his deserved reputation as a rising star with tuneful writing and impressive virtuosity. His muscular pizzicato is robust and resolute, while his strident bowing summons an array of incandescent sounds. Grassi offers a variety of approaches, from lithe cymbal work to roiling tom-tom workouts that recall primal African and Middle Eastern traditions. With an elastic sense of time, Lane and Grassi maintain rhythmic independence within these skeletal frameworks and rubato pulses while advancing the overall structures in subtly surprising ways. Each tune builds on a core theme which the trio orbits with variable dynamics and spirited intensity, allotting ample space for each member to be heard. Encompassing a variety of moods, the trio ranges from the vigorous free bop of "The Last of the Beboppers" and the surging deconstructed funk of "Chichi Rides the Tiger" to the cinematic Eastern modality of "Marshall" and the solemn dirge "Like Nothing Else," driven by Lane's acerbic arco work. The title track is representative, as Whitecage introduces a soulful melodic kernel before Lane and Grassi enter with a jaunty abstract rhythm. Each member contributes pithy statements before collectively merging into three-way discourse; Whitecage's torrid alto trades circuitous fragments with Grassi's rolling toms which in turn parry Lane's subterranean bass figures. 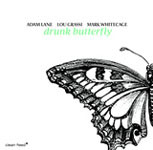 With years of experience in this milieu, Lane, Grassi and Whitecage reveal careful listening and empathetic interplay throughout Drunk Butterflytelling marks of only the finest improvised sessions. Visit Adam Lane, Lou Grassi and Mark Whitecage on the web. Track Listing: The Last of the Beboppers; Sanctum; Like Nothing Else; Chichi Rides the Tiger; Drunk Butterfly; Avanti Galoppi; Marshall; Imaginary Portrait; Five O' Clock Follies.